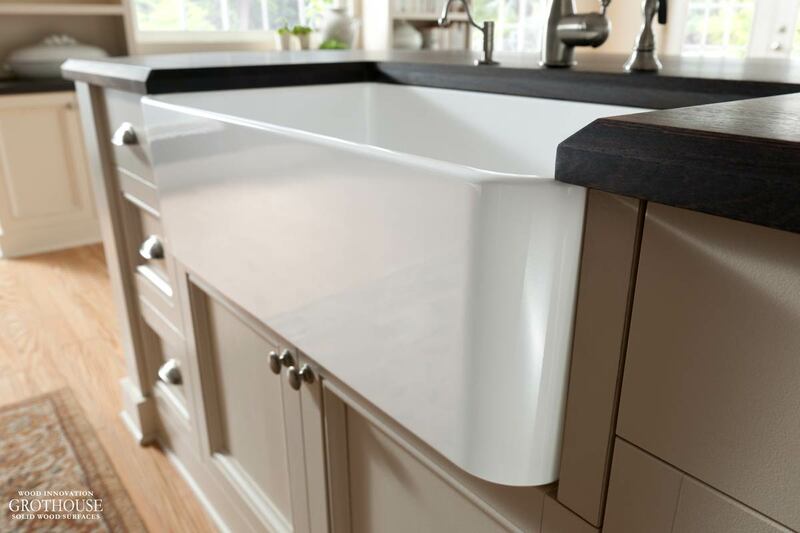 A current countertop design trend is pairing a wood countertop with an apron sink. This is a timeless combination that is popular in any style kitchen, especially in traditional and transitional kitchens. The type of wood selected for the countertop varies, but the most popular species is Walnut. Various types of apron sinks are used, from a classic white to copper and patterned sinks. When sealed with Grothouse exclusive Durata® permanent finish, the countertop is completely waterproof and safe from water damage. Durata® is available in different sheen levels, and the sheen level chosen varies based on the look the designer is striving to achieve. Durata® Satin finish is a sheen level of 35 and has an appearance similar to common household furniture and dining tables. Satin sheen is the most popular selection. Durata® Semi-Gloss finish is a sheen level of 55 and is the best application for a kitchen countertop with a glossy finish. Durata® Matte finish is a sheen level of 10 and has an organic appearance similar to natural oil finishes. Kelly Bailey of Coastal Cabinet Works designed a Cherry All Heartwood kitchen island countertop to feature a copper apron sink. The countertop is finished with Durata® Waterproof Permanent Finish in Matte sheen. 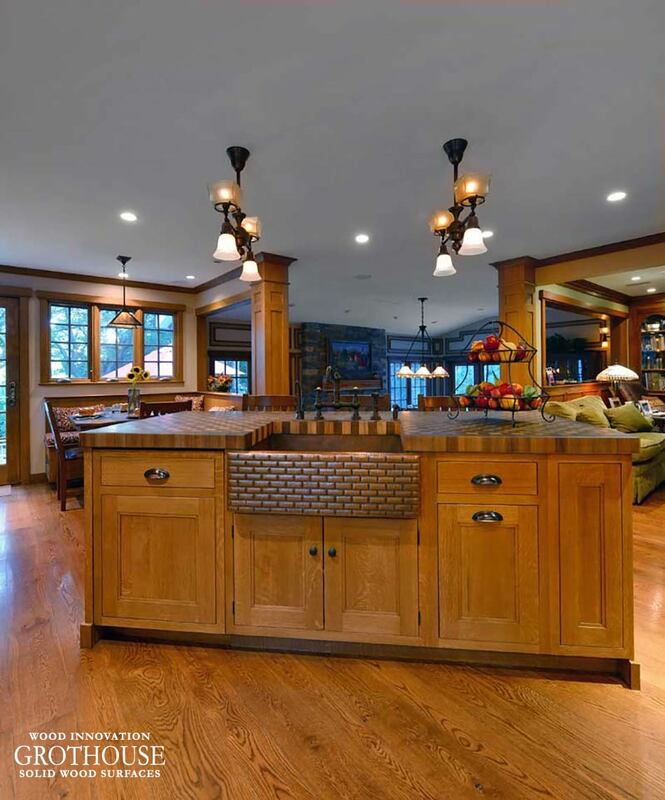 Walnut wood counters were designed by Chris Black-Puckett Design for the perimeter of this traditional kitchen. The walnut counters include a white apron sink with beautiful detailing on the front. The counters are accentuated with Level 2 Distressing and finished with Durata® Permanent Waterproof Finish. 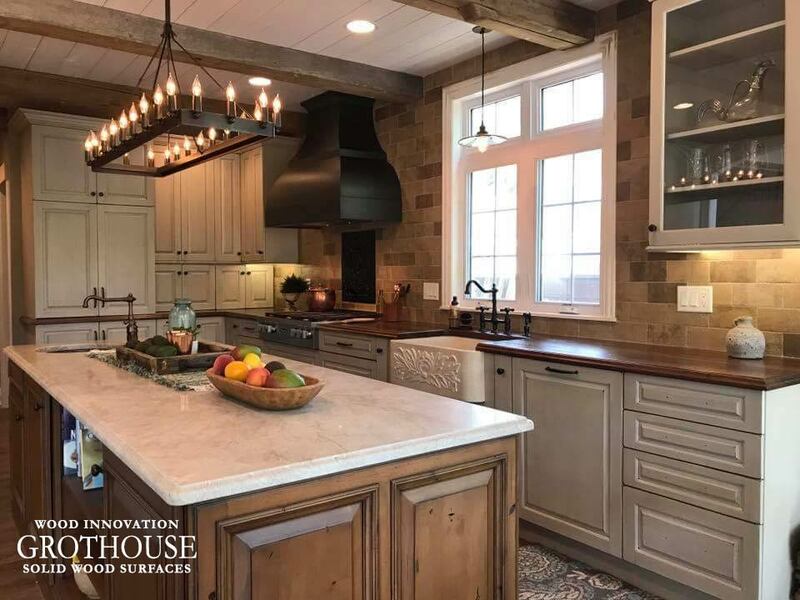 Showcase Kitchens designed a Walnut and Cherry checkerboard butcher block for the island in this traditional style kitchen. Although this is a butcher block, an apron sink was still able to be incorporated into the design. The wood butcher block is still safe from water damage. Want to see more kitchens featuring this countertop design trend? Visit the Grothouse Image Library! 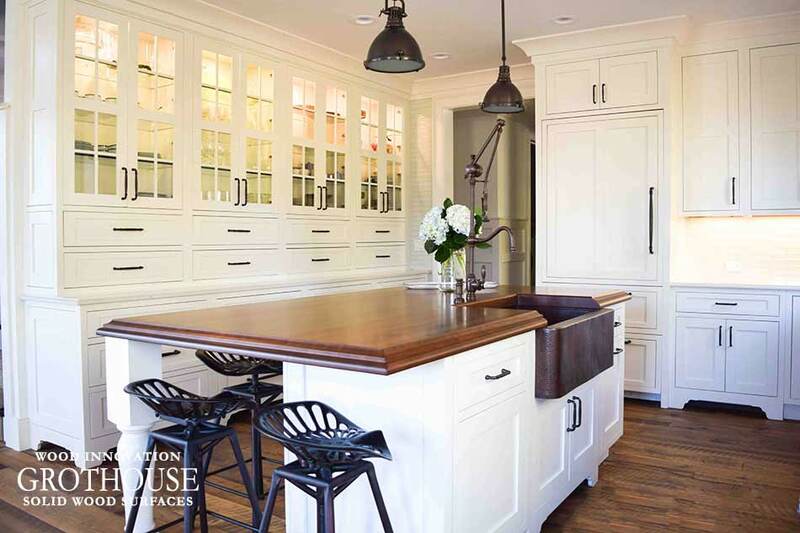 Be sure to follow @grothouseinc on Instagram to see more design trends. This entry was posted in custom wood countertops, Custom Wood Surfaces, Kitchen Countertops, Kitchens, Wood Countertops, wood innovations, wood kitchen countertops and tagged Butcher Block Countertops, Butcherblock Countertops, butcherblock kitchen countertops, Countertop Ideas, countertop options, custom wood countertops, Interior Decorating Wood Countertops, kitchen island, Kitchens, wood counter tops, Wood Countertops, Wood Countertops with Sinks, wood kitchen counter tops by Denise Grothouse. Bookmark the permalink.